I thought that weekends were supposed to be full of lazy mornings spent in bed surrounded by colorful glossies. Mine have turned into days full of mundane multitasking madness. Luckily these things have managed to keep me sane. A watercolor fashion illustration that showcases one of my favorite things – colored tights! Clever ideas for hosting your very own tea party. Little girls with cute kittens. The smell of Dunkin Donuts French Vanilla coffee brewing in the morning. A guide to vintage bookshops. Authentic love letters from historical figures such as Edith Wharton, Zelda Fitzgerald, and Charlotte Bronte. Fashion wisdom from Hello Kitty. Floppy hats that would make Brigitte Bardot swoon. I was walking through the store this morning, searching for a new headband to add to my ever-growing collection, when what to my wondering eyes should appear, but a new magazine that brought me great cheer! 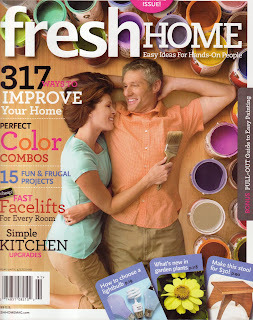 We have all been devastated over the loss of Domino, but I have found a solution to our woes...Fresh Home magazine. Over the past few weeks I have searched high and low for a publication that would provide me with the same joy as Domino, but kept coming up empty-handed. Until I discovered Fresh Home, that is. I love the size and the cover – it’s such a beautiful presentation; and each glossy page caused me to emit louder and louder high-pitched happy squeals. The DIY projects are explained in a way that anyone (from your favorite fashionista to your next-door Mr. Fix-It) can understand, which is something that the market was lacking until now. I particularly liked “The Right Paint,” page 62, wherein oil and water based, flat and satin paints are described so explicitly, that, after reading this, even I feel confident going to the hardware store to purchase the colorful stuff – something I typically would have never even considered. “The Right Brush,” “The Right Roller,” and “Paint Like the Pros” clinched the deal – now I feel like no painting project is too much for me to tackle! The black and white pillows propped up on the couch on page 54 of “Color Magic” instantly made me think of the glamorous Cleopatra, Queen of the Nile. And “Fresh Facelifts under $500” on page 74? Well, let’s just say that this is an easy, affordable, and painless way to undergo plastic surgery. 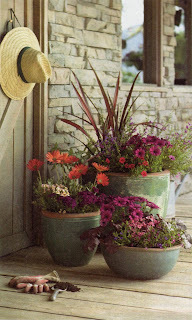 But I haven’t just been inspired to fix things up inside; Fresh Home has also given me some fresh ideas for outdoor projects like page 112’s “A Pot That’s Not” – I loved the sink and wagon planters. And I have just the wagon for this project – a vintage Radio Flyer that has been collecting dust in my garage since the early nineties! What can I say? There’s so much here for $4.99. Not just a magazine full of pictures of homes, but detailed accounts of exactly what to do and how to do it, with fresh ideas, interesting tidbits of information, and articles that are not only well thought-out, but written in an easy-to-understand fashion. I’m currently channeling my inner handyman, complete with paint-splattered Converse, distressed skinnies, and a worn-in boyfriend tee (hey, who says handymen – or women – can’t be fashionable?). It may be about DIY and affordable decorating, but it’s really a lifestyle magazine. It sets a tone for living life to the fullest by creating your own world. I can’t help myself, I love it. I’m hooked! I can honestly say that this magazine has something for everyone. Right now, I’m thinking of a friend who likes to barbecue who would love “Barbecue’s Back!” on page 128; and my sister’s boyfriend who will die for “Celebration Ales,” on page 130; and then there’s my treasure hunting cousin, who will swoon over “Sweet Flea,” on page 24. Let’s cut to the chase, I will be recommending this magazine to everyone I know, with sincere enthusiasm. Thanks to Fresh Home, and Design With You In Mind for the pictures. And if it was warm she wouldn't wear it much more"
Thanks to Wet Seal for the picture. I’ve always wanted to be a spy. Or a detective. You can blame it on long, lazy adolescent summers spent lying in fields of daisies accompanied by Harriet the Spy, Nancy Drew, and Trixie Belden. It never happened though. Instead, I simply developed an infatuation with trench coats. There’s something so chic, yet completely mysterious about trench coats that makes you feel like you’re undercover, even if you’re just window shopping or schlepping a cart through a grocery store stocking up on canned goods. The funny part? I’ve never actually owned a trench coat of my own. Instead I’ve just admired them from afar. I think it’s time that changed. I completely understand that if you’re trying for an incognito look – much like my beloved childhood pal, and Plaza Hotel resident Eloise – it’s probably not a good idea to opt for a trench coat that is the same cherry red color of the Corvette bought during the beginning throes of a midlife crisis; but I can’t help it. The Fendi Cotton Babydoll Trench is simply calling my name, and, I’m sorry to admit, I plan on answering. When I think of a true detective trench coat, this Church & State Maine Trench Coat is exactly what comes to mind. The fact that the bib is removable and the button closure is reversible gives it a two-in-one appeal. But aside from those glorious features, I just want to see it tossed over a chic little spring dress and paired with ankle strap ballerina flats. I can’t help but feel that it would be an adorable pairing. Correct me if I’m wrong, but I think I may slowly be falling in love with military styles. Case in point, this Burberry Empire Trench. The bodice alone is a full-on tribute to the military with a double breast that includes not three, not six, but ten (count them) ten chunky (and chic) horn buttons – and that’s not all. This adorable dove-colored offering also features pockets and buttoned cuffs. I know this may be wrong, but I’m not sure if I would treat this as a coat – it’s a complete outfit in itself! I saw someone wearing this Lauren Jeans Co. Denim Belted Trench Coat just the other day. I fell in love with it then, and I’ve fallen in love with it all over again now. I love, love, love the contrasting stitching; but the fact that it’s denim – yet looks completely sleek, chic, and magnifique paired with black, white, or any other color imaginable – makes me need, need, need it. I honestly don’t think it’s appropriate for any girl to go through life without a little lace in her closet. Therefore, this Rampage Lace-Trim Trench Coat is kind of a necessity in my book. The lace trim provides an otherwise oftentimes masculine look with a little dainty femininity that is sassy, sweet, and fierce all in one. Thanks to Net-A-Porter, Frances May, Burberry, and Macy's for the pictures. Aside from sweet lemonade, what does summer mean to you? To me it means a street cruiser bike complete with a wicker or wire basket attached to the front, and knee-skimming flirty frocks that make it simple to dangle your bare feet in newly-discovered bodies of water, or chase butterflies in vacant flower fields. I think I’ve found the best of both worlds. The Ruffled Bicicletta Tank Dress from Fred Flare is not only adorned with gold-trimmed ruffles, but features an old-fashioned bicycle print. The end-result is possibly the most darling, the most charming, the most divine creation imaginable. I could see myself having so many wonderful times in this clever little gem. Thanks to Fred Flare for the picture. When my mother was a child she convinced her parents to paint her stark white bedroom walls a lovely shade of lavender. After a few years she was thoroughly disgusted with the color and spent as few waking hours in the bedroom as possible. Somehow I don't think that my reaction to bubblegum pink walls would be the same. In my opinion, this is the stuff cotton candy dreams are made of. Besides, if Barbie and Betsey Johnson are able to survive in pink splendor, so can I! Thanks to Psycho Glitter for the picture. I'm currently playing the part of foster mother to a few cuter than cute kittens, which, when you think about it, essentially makes me a cat lady - at least temporarily. I know this is a title that many steer clear of; but I truly don’t mind it. As long as I’m able to dress (and accessorize) the part, that is. Do you remember when you were growing up and your grandmother would knit you sweater after sweater for just about every imaginable holiday? Sweaters that your parents forced you to wear to school even though the other kids on the bus would laugh and point their fingers at the crazy colors and loose ends? The Paul & Joe Sister Cat Sweater is reminiscent of those gifts from grandma – except for the fact that it is actually adorable, and something that you certainly wouldn’t need to be forced to wear. The cream color is the perfect backdrop to the bow-adorned gray kitty whose big sad eyes just scream for a hug – much like my own tiny charges. I realize that most wallets nowadays come complete with a change compartment, but they always seem too small to hold more than a few pennies; which is why I am enlisting the help of this Pretty Pet Coin Purse. The kitty face is simply a decal, but her bright red bow is fabric, and comes complete with a realistic red jewel. It’s certainly the perfect accompaniment to the aforementioned sweater, or any outfit that needs a hint of metallic glamour! 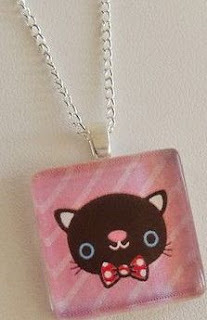 Costume jewelry is so much fun – especially when it’s as childlike as this Fancy Cat Necklace. The best part? The muted colors give it a vintage vibe, while the Kid Pirate original illustration provides a sense of irresistible whimsical innocence to the piece. When I adopted my first cat, Sassy, I was three months shy of eight, and she was a five-week-old ball of fluff who was showered with love, kisses, and attention from the moment she was placed in my arms. I dressed her up in doll clothes – a pink and white pinafore jumper, if I remember correctly – and pushed her in doll carriages. 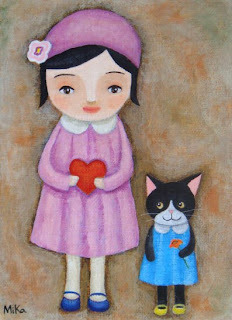 Sassy is still with me today, and this lovely little painting from MiKa Art Blog reminds me of all of the wonderful times we’ve had together. This would be the most darling piece of art to hang in a brightly decorated living room. Have you ever experienced one of those moments around the dinner table where there is dead silence, and the only thing audible is the sound of utensils hitting porcelain plates? I don’t think that moments like this would even be possible if you had these Jonathan Adler Salt & Pepper Cats sitting front and center on your dining room table. They add such a kitschy, unconventional feeling to dining room tables and kitchens alike that is undeniably purrfect. Since we're on the topic of cats, I thought I'd toss in Dewey: The Small-Town Library Cat Who Touched the World by Vicki Myron for good measure. I haven't read it yet, but I'm a firm believer in the fact that no library or bookstore is complete without a furry friend traipsing up and down the aisles. Plus, I think the kittens would love to hear all about Dewey's book-filled adventures! Thanks to Bob London, Kaboodle, Fred Flare, Etsy, MiKa Art Blog, and Iowa Beautiful for the pictures. 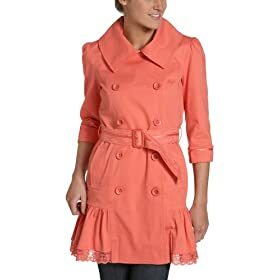 I can’t tell you how much it irks me when people pop over for a visit or a quick chat wearing the most perfect, the most amazing, the most irresistible outerwear on the planet, hang it on your coat rack, then promptly grab it on their way out before even offering you the chance to try it on for a mere minute. Which is why I am convinced that I simply cannot live without this Writing on the Wall Coat Rack from Urban Outfitters. In my eyes, this wall hanging gives you the freedom to swipe whatever tickles your fancy. After all, if someone really loves their coat, they would hang on to it for dear life, and if they're impartial to it, and uncaring of it disappearing, well, I guess it's up for grabs! Thanks to Urban Outfitters for the picture. One thing I learned yesterday is if you’ve never had cappuccino before, don’t indulge in 32 oz. of it in one sitting. I made that mistake myself and am still feeling the after effects. But even if my unexpected caffeine jolt wasn’t working to keep me in good spirits, these things would definitely do the trick. This little pink playhouse surrounded by all sorts of lovely shrubbery. Realizing that even after reading 10 Reasons to Stop Drinking Coffee, I refuse to kick the habit - it gives me too much joy. Barbie's debut at New York Fashion Week in honor of her 50th Birthday Celebration. A cherry red Valentine Shoulder Bag perfect for year-round accessorizing. Sweet little felt pouches with contrasting stitching. A bow bracelet that will bring the Blair Waldorf out in everyone. Silhouette cups that are too adorable to drink out of. Thanks to Rodney Smith Photography for the picture. Three Sheets to the Wind, $205. If this isn't love, I don't know what is. 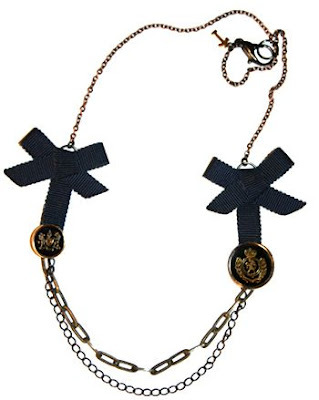 The navy blue ribbon bows flanking each side of this necklace add such a preppy, classic, girly feel to this piece; while the gunmetal and copper plated brass offer a chic toughness that is irresistible. For some strange reason I'm overcome with the desire to pair this necklace with white, elbow-length gloves for a nouveau take on Jackie-O's style. As much as I've always wanted to be a prep school girl, complete with crest-adorned blazer, knee-highs, and plaid skirt, I find myself giving in to my obsession with anchors, and opting for the Anchor Earrings, $55, as opposed to the Metal Crest Earrings, $55. Of course, either would most certainly bring a smile to my face. Just looking at these studly little gems makes me feel as if I'm aboard a cruise ship on my way to a tropical destination. Which pieces are your favorite? Would you choose the anchors over the metal crests; or would you select something from TomTom's Lovely Heartache Collection instead? And is it just me, or are you also smitten with the TomTom name, which instantly invokes images of an exclusive, members-only gentleman’s club or a ragamuffin alley cat known to terrorize the neighborhood? Thanks to TomTom Jewelry for the pictures. The Savannah Porch Swing from Grandin Road is truly what dreams are made of. The white provides such a beautiful, romantic finish; yet also presents a lovely canvas for creating different looks. The navy blue throw pillows shown here bring a nautical theme to life; red may invoke thoughts of a barbershop quartet; while purple could easily bring about a royal flavor. The opportunities are truly endless. Yes, I realize that the Siesta Quest Recycled Plastic Porch Swing from PatioLivingPlus is plastic. But the fact that it is offered in over twenty colors - including berry red, seafoam, and pink lemonade - adds a sense of childlike playfulness to your front porch. If I were able to, I can honestly say that I would banish myself to a private log cabin in the Adirondacks, and spend my days lazing in front of a fireplace, baking rich desserts, and taking long, languorous naps with my cats. Since that's out of the question, I feel that spending even just a small amount of time in this Cedar Log Porch Swing from SwingShowcase each day would do the trick. It has the power to bring a little cabin style to even a city atmosphere! Thanks to Grandin Road and Swing Showcase for the pictures. That sounds like the cheesiest pick-up line, I know; but it’s actually fully appropriate for the most adorable. Most delicious. Most fabulous clutch on the planet. 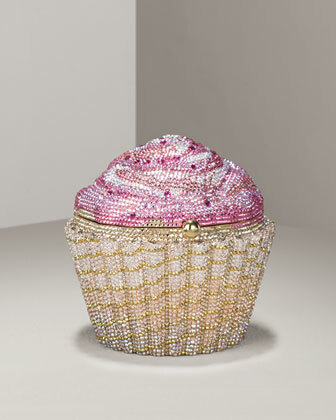 The Judith Leiber Limited Edition Strawberry Cupcake Clutch is possibly the most wonderful creation in handbags since Chanel brought the quilted purse to life. I fell in love with it the day Katy Perry arrived at the 2008 MTV Europe Music Awards with the yummy accessory in tow, and haven’t stopped thinking of it since. It’s splendidly sweet, and possesses all the cuteness of a cupcake without the empty calories! Thanks to Neiman Marcus for the picture. 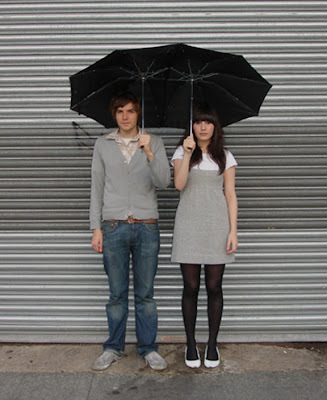 Monday it was all about a bicycle built for two, but today (most likely due to the rain) I’m all about an umbrella built for two. Have you ever seen anything so luxurious? So unique? So romantic? Albeit, I’m sure that city sidewalks would be fairly unaccommodating to such a cumbersome object. But it’s still number one on my most coveted list – at least for today! I'm well aware of the fact that this woman is standing in the middle of New York City, but there's just something so...French about her. The Ali MacGraw Love Story hat, the all black palette, and, my personal favorite, the red and black oxford pumps. I can actually picture her sitting at a chic cafe in the middle of Paris, noshing on croissants and sipping espresso. Thanks to StyleSightings for the picture. Ah President’s Day, a chance to sleep in on Monday, enjoy a luxurious long weekend, and don fashions that our forefathers would most definitely approve of! 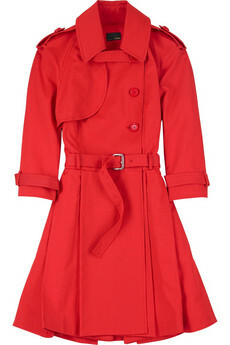 RED: June Button Front Mod Shift, Corey Lynn Calter, $147. Red on red on red, with a nice dosage of gold. It's sixties London, with a dash of military action thrown in via the four gold buttons down the front. And lets not forget the pockets. There is nothing I adore more than a dress with hidden pockets. WHITE: Roxbury Ankle Jean, Paige Denim, $195. The perfect length to show off our beautiful ballerina flats, chic cutout pumps, glamorous gladiators, or enticing espadrilles. The perfect color for the spring and summer. The perfect fit. The perfect...everything. BLUE: Noued D'Amour Bag, Valentino, $1,095. First it was the red bow hairband for Gossip Girl's Blair Waldorf, now it's a blue bow bag absolutely perfect for your tiny essentials - lip gloss, cell phone, credit card. Valentino can do no wrong. 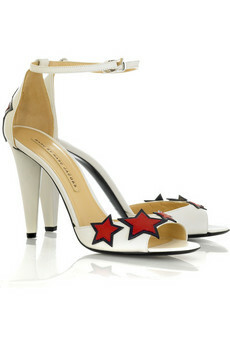 RED, WHITE, and BLUE: Star Strap Sandal, Marc by Marc Jacobs, $485. Words cannot describe the beauty of these pumps. It's as if they were crafted especially for proudly displaying your patriotism. And the best part is that they pair well with just about any of your spring and summer frocks, so you can rock them for more than one season. Thanks to Corey Lynn Calter, Shopbop, Saks Fifth Avenue, and Net-A-Porter for the pictures. I realize that Valentine's Day is over, but I just couldn't resist gushing over this I LOVE YOU Greeting Card from le papier studio. From the moment I first saw it I fell in love, and I simply can't get it off my mind. 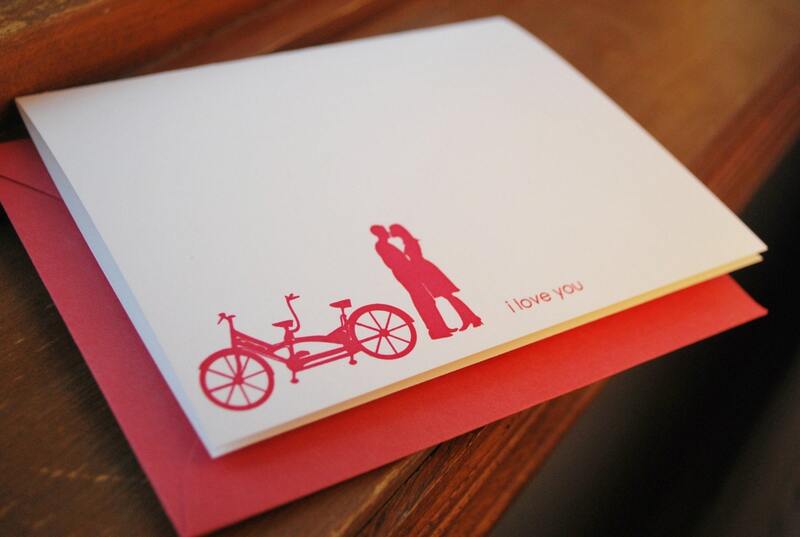 I don't think there is anything on earth as romantic as a bicycle built for two! Thanks to Etsy for the picture. A cowboy hat-adorned bust, the contrasting blue walls and acid green chaise, the cumbersome chandelier, it’s just kitschy enough to pair with the tale of a girl who has an assortment of plastic ponies hidden under the kitchen sink of her New York City apartment a la Sloane Crosley in I Was Told There’d Be Cake. There’s something so Holly Golightly about those pillow eyes. I can’t imagine curling up with anything but Truman Capote’s Breakfast at Tiffany’s in this bedroom. Sir Arthur Conan Doyle always brings to mind cozy sitting rooms, warm fireplaces, hot coffee, and yummy pastries. This room manages to invoke the same images. Toss in some rain, a little thunder and lightning, and it will be the perfect place to read about Sherlock Holmes’ and Watson’s adventures in The Hound of the Baskervilles. Even though it covered more of the eighties and nineties than anything else, I can’t help but feel that Jancee Dunn’s But Enough About Me deserves to be read in an offbeat room that is sparsely furnished, but accessorized with seventies-esque seating arrangements – much like the one featured here. It’s just as trippy as her adolescence was! Whenever I think of Dorothy Parker I see two colors: red and blue. This is the perfect place to indulge in Parker’s dry wit via The Portable Dorothy Parker as it embraces both of these colors just enough to make me channel my inner Dot. What are some of your most-adored books, and where are your favorite places to read them? Thanks to Domino for the pictures. 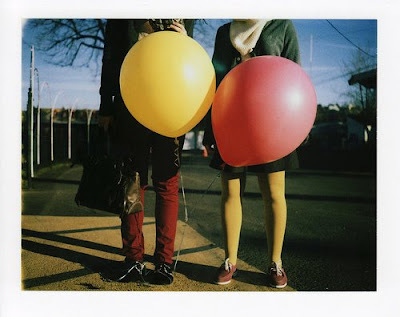 May your day be full of conversation hearts, stolen kisses, love letters, and a new fashion find or two! Thanks to Absolutely Beautiful Things for the picture. How is it that things often come crashing down on you at the same time, and you’re forced to juggle everything at once? This week I had my first official math test of the semester, and had an enormously hectic work week (even though I was out sick for most of it) – things that had to be handled all while fighting a monstrous case of the flu, which seems intent on lingering for as long as possible. Luckily stuff like this managed to get me through the week. -Despite the fact that I am, in the words of my allergist, “Deathly allergic to dust,” I decided to take my chances and embark on a hunt for treasure in my very own garage on Sunday afternoon. While the sneezing left me somewhat worn out, the fact that I discovered a few vintage Moppets paintings from the 1960’s (including this - and this - among others) more than made up for it. -A bedroom that anyone would be proud to wake-up in. -DinerCity which has given me a virtual listing of cute, vintage diners to visit all over the United States, as well as Canada! -Realizing that this 2003 cartoon from The New Yorker perfectly sums up why I am a vegetarian. -This Floral Lace Headwrap which conjures up visions of The Great Gatsby’s Daisy Buchanan. -Discovering that my newest addiction – Sloane Crosley’s I Was Told There’d Be Cake – may be coming to HBO. -The retro/vintage vibe of this video. -The prospect of a three-day weekend. What got you through the week? Thanks to Unruly-Things for the picture. I was perusing the Marie Claire website a couple of days ago when I stumbled upon the article "10 Things We Hate About Valentine's Day." More importantly, however, was the photograph that accompanied the piece. I like to think of it as The "Anti" Girl. At some point in time we are all The "Anti" Girl. Anti Prom. Anti Valentine's Day. Anti Cheerleading. Anti anything. This photograph embodies The "Anti" Girl to a T. The tiara. The cigarette. The teased, yet perfectly chic, coif. The cigarette. The posture. The champagne bottle. The backdrop of a bathroom, signifying that the torture is too much to handle, and seeking solace in a locked bathroom where a party for one can be had is preferred over hobnobbing with the so-called jocks and prom queens. It's all just so...perfect. This is my style inspiration of the day. You just can't go wrong with The "Anti" Girl - especially on the Eve of Valentine's Day. Thanks to Marie Claire for the picture. "Domino’s demise does not, in the end, sound a death knell for the girly aesthetic it promoted. It leaves a vacuum in the print media, to be sure, but on the Web, Ms. Angelotta, Ms. Meares, Ms. Royalty and their sisters all contribute to what Ms. Salzman, the trend spotter, would describe as a ‘granular’ portfolio of ideas, ‘you know, something by, for and about them, friend-to-friend stuff,’ she said. In other words, the blogs." – "Domino Magazine’s Fans Mourn It’s Demise," The New York Times. I’ve known about Domino’s demise for more than two weeks now, but it’s as if the harsh reality of never seeing the magazine grace newsstands again didn’t sink in until I read the aforementioned article.. It raises such an amazing point...if only we could have protested to keep the magazine alive and kicking – would it have been to no avail? It still seems unfair. As much as I love the blogs (I’m a blogger myself, so why wouldn’t I? ), the world wide web is so much different than a glossy you can hold in your hands and read while lying in bed. I guess I’m in the same boat as Sandee Royalty. Such a fantastic pastime; but we will no longer have Domino to fulfill that need – either in print or Online. So what are you going to do now that Domino is no more? It’s a given that nothing can replace Domino, but what magazines will you be perusing to fill the empty hole it has left behind in the magazine world? Will you turn to Martha Stewart Living? Seek solace in Romantic Homes? Explore the pages of the extremely-chic Elle Décor? Titles please; I need titles! Thanks to Typophile for the picture. Valentine's Day is typically a breeding ground for pink hearts, candy kisses, stuffed teddies, and red roses. Not that I'm against any of the aforementioned - far from it, in fact - but I can't help but adore this sophisticated addition to Valentine's Day fare from Kate Spade. The Griffen Valentine's Tote sports a fun-loving orange leather trim which meshes perfectly with any hints of pink or red you may be wearing; while the beige canvas tote is adorned with nine sweet terms of endearment that would make any girl blush. What's not to love? Thanks to Bags Blog for the picture. 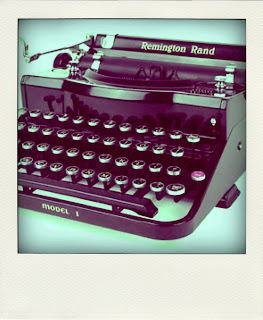 The pen is mightier than the sword, but a well-aimed typewriter packs good punch too! Every now and then I get tired of modern conveniences and begin daydreaming about the items of yesteryear. 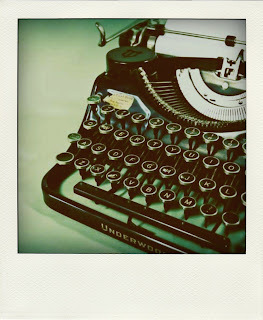 Today my focus is on typewriters. 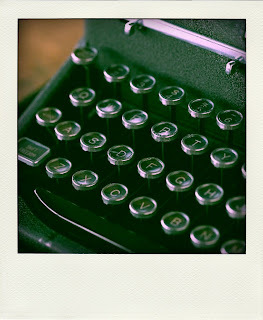 When I was seven-years-old, already bitten by the writing bug and not yet the proud owner of a speedy computer, I found an old typewriter in the garage and promptly lugged it into the warm comforts of our home. It was then and there that I began to bang out my very own newsletters, newspapers, articles, short stories, and how-tos which circulated around my family, friends, and close-knit neighborhood. Even now I get giddy at the sight of an antique typewriter. To think what type of masterpieces have been written upon them, and whose fingers have flown across the keys (Dorothy Parker? F. Scott Fitzgerald? P.G. Wodehouse? Truman Capote? ); it's almost too much to fathom. The history that each one holds is amazing. 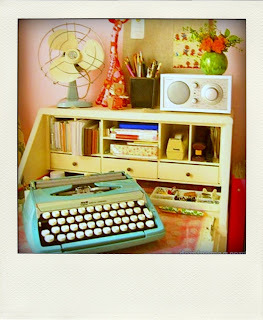 One day I plan on having a room devoted entirely to vintage typewriters. For now, I'll pay tribute to them here. 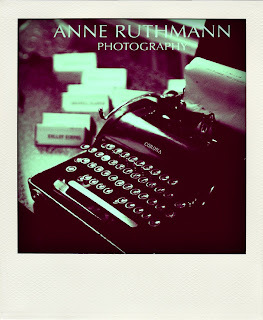 Thanks to Dirty-Paper, Anne Ruthmann Photography, Domino, Roadside Scholar, and Altruism in the Morning for the pictures. I love the fact that two of my favorite colors - black and white - were used as a canvas, pairing a black skirt, black tights, and a white blouse together; then slipping on a pair of pointy-toed black and white Oxfords (which I love), and adding a splash of color with a baby blue neckerchief, and a rust colored shoulder bag. It's impossibly chic, and perfect for a day at the office, or a day of window shopping. Oddly enough, the blue door in the background manages to pull the whole thing together! Give Me Lauren Moshi or Give Me Death!